The article below was published on Hadassah Australia webpage, including the video that they produced. 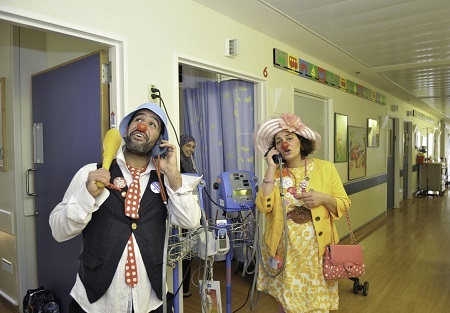 Hadassah Hospital introduced medical clowns to Israel in 2002. Today, every major hospital in Israel has them and they are empowering patients and staff in what is being termed a ‘medical revolution with a happy face’. Every dollar we raise buys one minute of a medical clown’s time at Hadassah. Each minute frees up about three and a half minutes of medical resources for its young patients. Research shows that medically trained clowns reduce the stress levels in children, making it easier for medical staff to provide their services, which results in a shorter hospital stay for the children. The hospital clowns help acutely ill children lose their fear of hospitalization and treatment, and they forge a deep connection with the chronically sick youngsters, even those who are withdrawn and remote. Once the clowns reach them, it opens the way for the medical staff to do so as well. For all our youngsters, the clowns turn the hospital experience into something pleasurable. Doctors and nurses use the assistance of the clowns in the treatment of various medical procedures from simple blood tests to the escorting of children to operating rooms, from physiotherapy to HIV treatment and emergency room actions. Laughter, like exercise, can reduce stress, improve tolerance to pain, and alter bodily functions such as blood pressure, heart rate, muscle activity, and stomach acidity. Unlike medical staff who come and go based on the procedural timetable, Hadassah’s clowns stay with a child only if invited, allowing hospitalized youngsters to decide what they want. The clowns can also motivate children. Doctors and therapists at Hadassah note that a child can get excited about reaching for a bubble blown by a clown, even if it involves the same movement he or she was resisting moments earlier.